Hier ist ein schönes Foto, das ich heute Morgen auf dem Blog des italienischen Comicexperten Luca Boschi entdeckt habe. Don war im Rahmen der (im vorherigen Eintrag erwähnten) Papersera-Preisverleihung und des Turiner Comicfestivals bei ihm zu Besuch und gemeinsam mit Frank Stajano und Pier Luigi Gaspa wurde dann das von mir gedrehte Haus-Tour-Video angeschaut. Don sah den fertigen Film dabei zum ersten Mal, da er sich letzte Woche bei Onlinestellung bereits auf dem Weg nach Italien befand. Schaut euch - auch wenn ihr kein Italienisch könnte - den ganzen Artikel in Lucas Blog an, dort gibt es noch einige andere lustige Fotos. Here's a nice photo I found this morning on Italian comic expert Luca Boschi's blog. 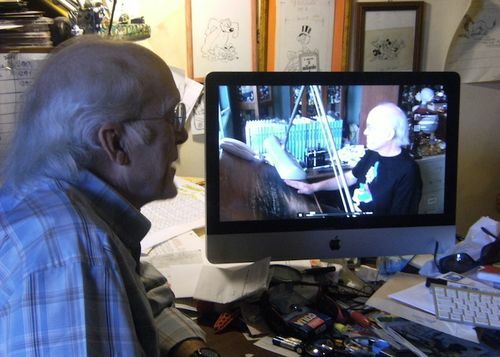 Don visited him during his current visit to Italy for the Papersera Award ceremony (see last post) and the Turin Comics Festival, and together with Frank Stajano and Pier Luigi Gaspa they watched my video tour of Don's house. This was the first time Don saw the finished film -- he was already on his way to Italy when the videos were published last week. Even if you don't speak Italian, have a look at the whole article on Luca's blog, there are some more great and funny pictures.